On a cool morning, a few days after Father’s Day, at 7:05 am when we drove into the parking lot of IHOP and opened the silvery doors of our minivan. We tried to pull the kids out without the toys and miscellaneous vacation items falling out. I looked around the parking lot to see if they were waiting in their car. My 17-year-old brother was going to be there too. No people looking like the photos I had seen were waiting in a vehicle. So I straightened my clothes and fixed my hair to look my best as we walked across the parking lot with a child holding my hand. This whole day seemed the opposite of how normal life is. You usually take your father to meet the young man you want to marry, not take your husband and children to meet your father. But my entire life has not been “normal.” I have come to terms that my life was God’s choice and He allowed me to live in the life He had designed for me, with my mother and without my father. There was always a vacuum in my heart because I had never met him. There were questions and longings to always feel loved and accepted. The desire to want to feel loved and not lonely. The thought that if I had passed my father on the street that I would not even know what he looked like and he would not know me. I was given his name some time into junior high and high school and done searches on his name on the internet. There were probably 8 men in the U.S. with the same name with various addresses around the country. How would I know who to contact? I did not attempt to contact any of them. Fear walked with me and spoke with me, causing me to worry. I worried that if I did contact him that he would not want to know me. He knew my whereabouts when I was 2 years old but never pursued me. Maybe he had no wish to have a relationship. The questions in my mind could go on forever speculating motives and not understanding reasons why things happened the way they did. I had begged my mother my senior year, months before my graduation to find him so that he would know that I was graduating. I wanted him to be proud that I had accomplished something good in my life. Needless to say, that did not happen. 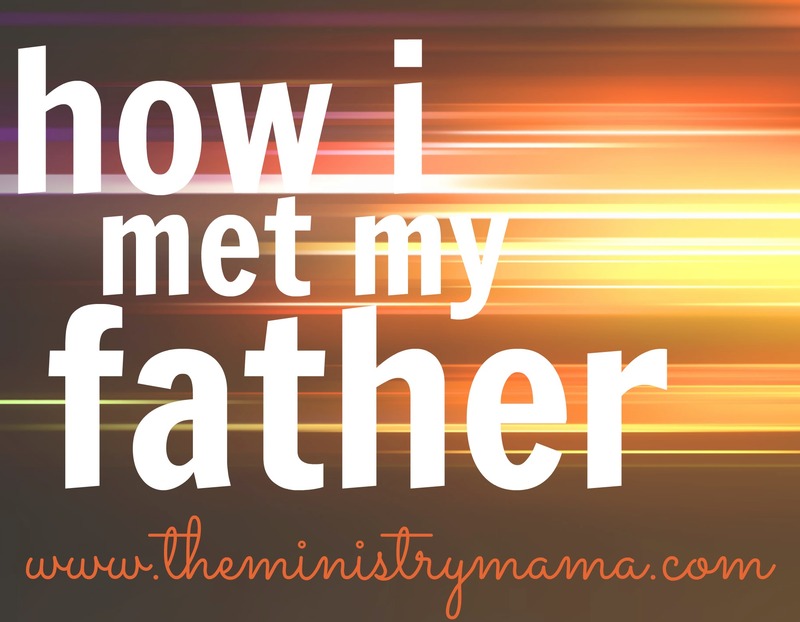 I went on to Bible college and followed God’s call in my life but watched as God, the Father to the fatherless, helped me when I needed Him the most. Alone to provide for my school bill, God helped keep it paid, then provided a job so that I could pay. He provided loving family, my aunt and adopted families were very helpful to me throughout my college years. God always bridged the gap and ministered to my heart. As I walked into the IHOP entrance, I looked down at the small brown squared tiles as I followed my husband into the door. We walked into the waiting area and it was empty. Now to wonder whether we were there first, or what was going to happen. Then, looking around the room, he waved from a table way in the back of the restaurant. He and my brother both stood and walked to meet us as we met them. It was not nearly as hard as I had expected to walk up and give a sideways hug. They were family… but then again, they were strangers. Our children were ushered into a booth and we sat at tables connected. I sat across from my brother, diagonal from my father. So, that’s what he really looked like in person! A tall man with large broad shoulders. He had a Texas accent and a nervous laugh that surfaced now and then. His hair is a sandy brown color and naturally curly. As my brother talked about himself and his mother and his sisters, I was overwhelmed. He loved them so much and complimented them so many times, that I wanted to meet them myself. They sounded like wonderful people. I hoped we could maintain a relationship and become close. I ate most of my breakfast but did not talk as much as my husband did. He talked and broke the ice for me, so that I did not feel so uncomfortable. How do you bridge the gap of years with someone whose title should equal a familial closeness? We could not bridge the gap of this relationship in a few hours of a day. I also took multiple trips to the bathroom with my kids, it was embarrassing and funny all at the same time. Apparently he asked my husband if I was going to be alright when I was away. He assured him that I was fine, but it was going to take time. I think he understood. The kids did not know that day who my father was, but some months later we explained that day at IHOP. We made a decision not to tell the kids in case things did not work out so they did not end up being hurt. We explained the situation to them and they understood in their childlike innocence and were sad I had that type of childhood since they love their Papa so much. Finally we explained that it was good that he was in our lives now, and they wholeheartedly agreed. The time passed and it was time for us to get on our journey to reach our vacation destination on time. Another sideways hug in the parking lot and then they walked away. I did not know in those moments if they would walk away forever or not. Would I still be accepted after they left? That question was hanging in my heart. As they drove away, they both waved good-bye and we smiled and waved and continued putting our kids in the car. Meeting him and my brother was a start. He does keep in contact often. I know that we have been worlds apart and our lives very different. I only know of 1 or 2 people who have ever met their father or mother as an adult, who was not adopted, which makes it hard to find people to talk to about the situation. There is a comfort that even though circumstances did not bring us together until that day at IHOP, that God was with me. He preserved me for His purposes for my family and for our ministry together, so that I could do what He wanted me to do. It’s been a year now, and I pray the bond will grow and that he will learn to understand me for who I am. I hope he will appreciate who the Lord has made me to be. If he never does, my purpose is to always please God my Heavenly Father. If you in your life or ministry know of an adult child that is meeting their parent for the first time or are navigating through this type of relationship and need someone to talk to, please have them contact me on my Contact page. I would love to help or listen if I can. If you enjoyed this article, you may also enjoy, How to Help the Fatherless Child on Father’s Day.